Now’s the moment all that hard work earlier on in the year is really paying off, with harvests coming thick and fast. But how do you know when it’s the perfect time to harvest your crops? Read on or watch our video to find out exactly how to tell when your fruits and vegetables are ready, so you can pick, pluck or pull up your homegrown produce at its prime. When it comes to root vegetables, size matters. Beets and turnips can be pulled at any point from golf ball size up, with smaller roots proving especially tender. But don’t let the roots grow larger than a tennis ball or they’ll become tough and woody. Dig up carrots as they reach a useable size. You can leave maincrop varieties in the ground until you’re ready to use them. Enjoy parsnips any time after the leaves have died back, but for the sweetest, melt-in-the-mouth roots, wait until after the first frosts, which improve the flavor. The earliest new potatoes are usually harvested about 10 to 12 weeks after planting when the plants come into flower. You can judge how big the tubers are by carefully pulling back the soil to expose a few at the sides. Enjoy them once they reach the size of a hen’s egg. Maincrop potatoes for storing should be lifted only after all the foliage has died back, around 20 weeks after planting. Check they are ready by rubbing the skin with your thumb. If the skin doesn’t rub off, they’re ready to lift. Check whether peas and beans are good to go by literally getting to grips with their pods. Feel the pods to judge the size of developing peas, then shell a few to double-check. The same goes for fava beans. The pods of climbing beans are the opposite – they should be long and smooth, without beans bulging inside. But don’t let them get too long or the pods will become stringy and plants less productive. For other fruiting vegetables such as peppers and tomatoes, be guided by skin color. Look for a good, even color over the entire fruit. Traditional varieties of cucumber are ready when there is no pronounced point at the tip. Pick them small for snacking cucumbers, or leave them to grow larger for slicing. Many gardeners pick zucchini far too big – it’s easy to do! But the best-tasting zucchini are picked soon after they reach about four inches (10cm) long. Summer squashes can be harvested as soon as they reach a desirable size. Leave winter squashes on their plants until late autumn. They can be protected with a row cover. They’re ready when the stem has died off and hardened, and if you push your thumbnail into the skin it should dent, but not puncture it. Perfectly ripe sweet corn is a seasonal treat like no other. Find out whether they’re ready to pick once the tassels at the ends of the cobs have shriveled up. At this point carry out the fingernail test. Peel back the sheath and sink your nail into a kernel. If it exudes a milky liquid it’s ready to pick and enjoy. If the liquid is clear, wait a little longer. Loose leaves of cut-and-come-again salads are best enjoyed while they are still young and tender, while heart-forming salads such as lettuce should be cut as soon as the heart has begun to firm up. In all cases, for the most succulent salad leaves pick them early in the morning. Cut cabbages as soon as the fleshy leaves have formed a tight, firm head. Winter frosts help to enrich the flavor of Savoy types, so leave these in the ground until you’re ready to eat them. Cabbage family plants producing flower buds, such as calabrese, broccoli or cauliflower, should be picked while the buds are still tightly closed. Garlic, onions and shallots may be dug up as soon as the foliage starts to die down in late summer for using fresh. For storing, wait two weeks once the foliage has turned yellow and toppled over, then dig up the bulbs and cure them for storing in a cool, dry place. Check whether tree fruits such as apples and pears are ready by cupping a fruit in the palm of your hand and twisting gently. If it easily comes away it’s ready. Softer tree fruits such as peaches and nectarines are ready when they become slightly softer at the stalk end of the fruit. Use your senses to pick soft fruits at their prime. Berries and currants should be evenly colored. 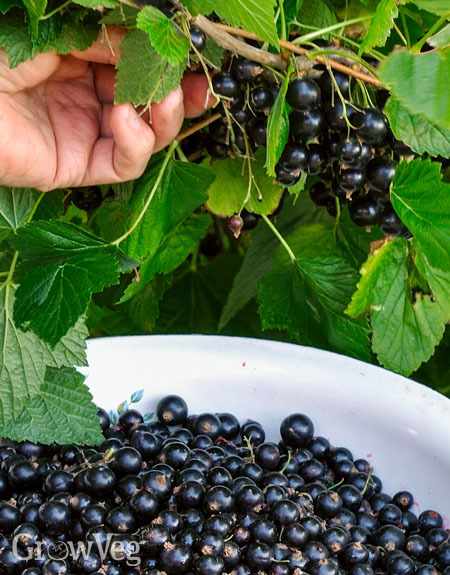 Raspberries will come away easily from their plug, while blackcurrants should be left a week after turning black to develop their full flavor. Blueberries develop their best flavor two or three days after turning blue. After so long tending your crops you deserve to enjoy them at their peak. Pick your produce when it’s perfectly ripe and ready and your food will have optimum flavor and the most nutritional benefit. Please do tell us in the comments section below what you’ve been growing this year and how you make the most of it. "this is our first year gardening. we have green beans, cauliflower,broccoli, egg plant,spaghetti squash,zucchini, yellow squash,iceberg lettuce,romaine lettuce,carrots, green peppers, tomatoes,corn and more but i cant remember...i cant wait "
"That is fantastic Betty. Keep up the good work and I hope your first year is a success. Enjoy!" "I pick tomatoes as soon as they start to show their ripe color, whether red, orange, yellow or multi colored. This removes them from the reach of whatever critters love to take a bite or two. After ripening (and being admired) for a few days on the kitchen counter, they taste just as good as “vine-ripened.”"
"Good tip Linda, and a good way to beat the critters at their own game!" "it's my first year too and we are enjoying all our own fresh chemical free veg but our early potatoes' have a problem, the skin looks fine but I have to peel and chop all of them before cooking as they have a problem that can only be seen once cut in half. some of them have yellow mottled marks inside, sometimes it effects the whole potato and sometimes just half of it. sometimes I have to throw away half of my basket, I haven't tried my main crop yet to see if they have the same problem. I planted far too many early, they are in raised beds but the only soil we had had manure mixed in, beggars can't be choosers. they were covered with bark, anyone have any ideas of what the problem is. we live in north west france." "Hi Melanie. It could be potato hollow heart disease, which sometimes occurs when you have alternation between periods of slow and fast growth. The best way to avoid it in future is to ensure consistent soil moisture, which is helped by a generous addition of mulch. " "hi ben, i'll google that thanks. I water every morning without fail, too much slug damage evenings and I mulched with bark. i'm just setting up a new computer so not able to take any photos looks like peeled apples when left too long. "